Lots of things to cover, so let’s do this thing. Newton and Fairley are Autobots! My baby’s a model. I knew this day would come. Just kidding. The talented lady behind Lil Miss Muffin just happens to be the wife of a former co-worker, and we got together Saturday morning so little Bean can showcase some of her lovely designs. The photo shoot (that sounds so professional) was a lot of fun to watch, and Bean was a natural! And now I know how averagely crazy moms become pageant-crazy moms. 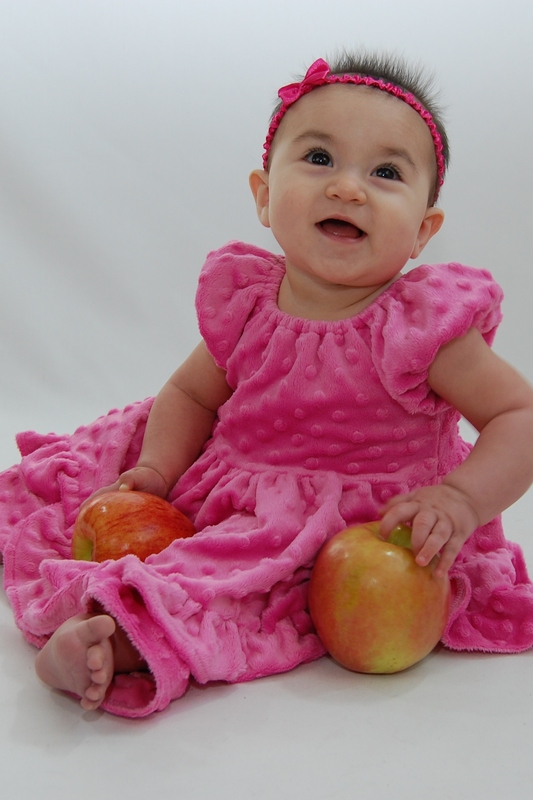 As in, my baby is the most beautiful, so give her a tiara to prove it! Okay, maybe not so much, but nevertheless, I’m pretty sure I won’t say no when Parents Magazine comes knocking on my door. Hubs peed his pants. He didn’t really, just to clarify. As you know, Hubs is thirty, and I’m still his twenty-something trophy wife who was (to my own surprise) pretty good at leading a double-life for nearly four months, and, with help, nearly sent him into cardiac arrest Saturday night. The venue was, in a word, PERFECT. Even though they won’t give me a discount, I’m still going to plug them like a bad hair transplant. Dancing Bear Lodge was spec-tac-ular. 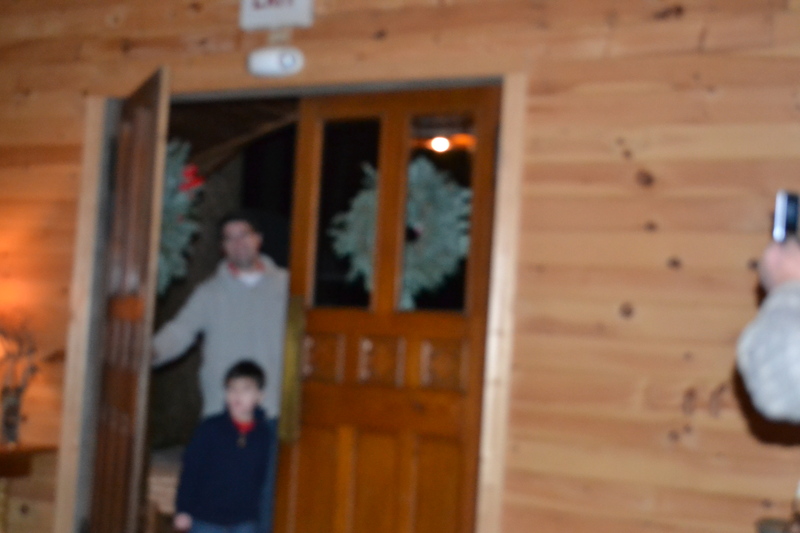 The food was delicious, we had a room all to ourselves, and all of our family stayed in the cabins, so we were able to stretch the party out to Sunday. And Hubs had less than zero suspicions, despite this being in the works since September. Newton and Fairley are Autobots. I couldn’t have asked for a better National Championship game Monday night. Well, actually, a better game would have been Auburn up forty points by half-time so I didn’t have to stay awake until 1AM, clutching Bean in my arms while she slept and trying to remember not to spike her when Auburn lined up for the final field goal for the win, after Oregon got their second two-point conversion of the game (I thought those were supposed to be hard! Come on, Tigers, what the deuce!). But this game had superhuman athleticism (did Fairley just pop out of the ground for that sack? ), drama (let’s see how many times we can turn over the ball in ten minutes, ready, set, GO), passion, blood, sweat, tears, and the big W for this Auburn fan. And we had the special privilege of watching it with Hubs’ dad, who braved snow and sleet to stick around town just to catch the game. And I’m pretty sure I saw Newton transform into a stealth jet at some point in the game, and Fairley is basically a tank with legs. And is Dyer Ronnie Brown incarnate? I happen to think so. There’s a good chance they’re all getting paid more than I ever did at any honest, respectable job (except for that one I had…) (just kidding), but at least it brought results. WHO-DEY! It might be another fifty-odd years before we can claim another, but we kept the trophy in the SEC, as well as in the state. Love the part about remembering not to spike Bean. Funny. 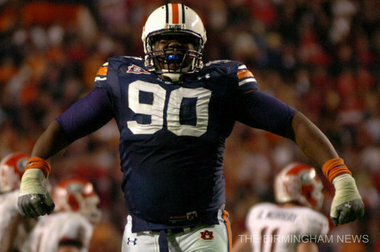 Fairley is a monster. He scares me. It was a more conscious effort than any good mother would have had. And I’m just glad Fairley wears blue and orange. I heard he eats three Bengal tigers before every game.